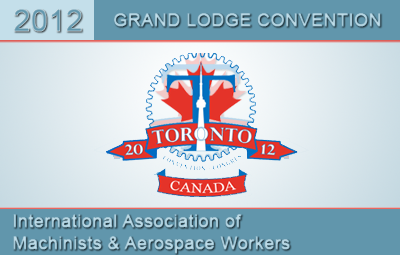 This year the 38th Grand Lodge convention was be held in Toronto, Canada. Local 264 was represented by the delegates elected by the membership. The delegates were Anthony “Snuffy” Mastandrea, Jim Mastandrea, Craig Hughes, Jim Foley, Mike Vartabedian, Jim Bain, and Jeb Mastandrea. This year each delegate headed to the Metro North Convention Center each day from 8:30am to 5:30pm and participated in open, democratic discussions, debates and votes on crucial issues that helped establish IAM policies and programs for the next four years. Here are some of the highlights. Opening of the 38th Grand Lodge Convention. Policy Makers call for a strong aerospace program. Endorsement of President Obama for re-election. At the end of the six day conference it was announced that the 39th Grand Lodge Convention will be held in Chicago, Illinois.